Vancouver is blessed with being a city that has it all – the cosmopolitan and international energy of its diverse residents and the majestic natural beauty of the North Shore Mountains, Vancouver Island and Burrard Inlet. 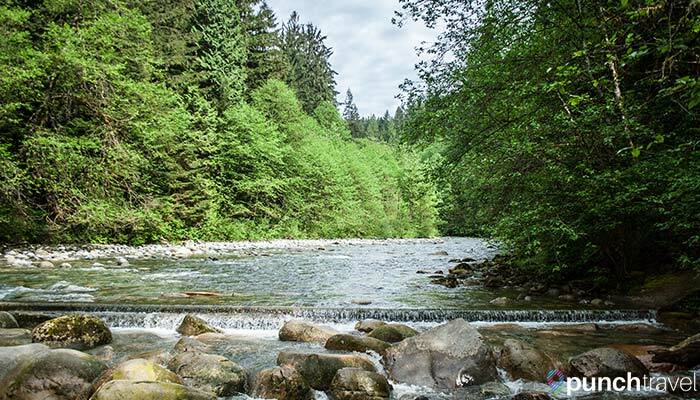 Take advantage of the picturesque landscape by taking a hike through one of the many hiking trails around Vancouver. 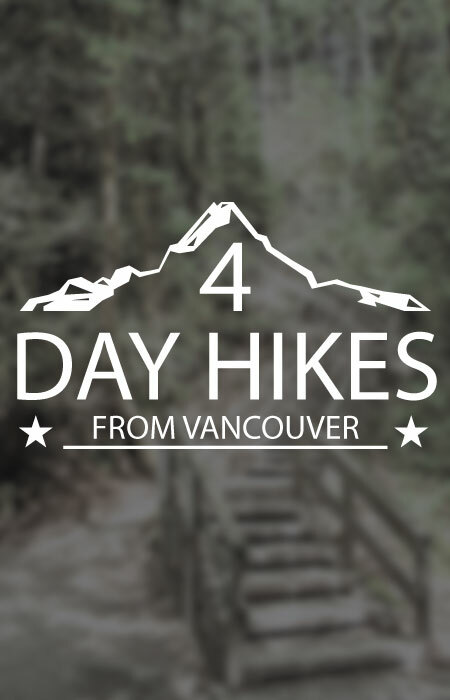 Whether you are a lean, mean, marathon-running machine or someone who only walks as far as the driveway and back, there is a hike in Vancouver for people of all athletic levels. Hiking in Vancouver rewards you with peaceful moments like these. 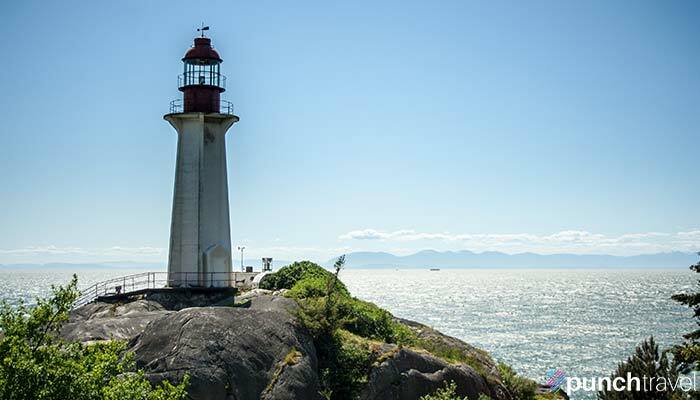 In West Vancouver overlooking the city and the sound, sits Lighthouse Park, a popular park covered with lush rain forest. The hiking trails in the park are relatively easy and can be completed in 2-3 hours. Port Atkinson Lighthouse overlooking Howe Sound. From the parking lot, head straight ahead to the main attraction, the Port Atkinson Lighthouse. The current lighthouse dates back to 1912 and was used during World War II for surveillance against incoming enemy ships or submarines. 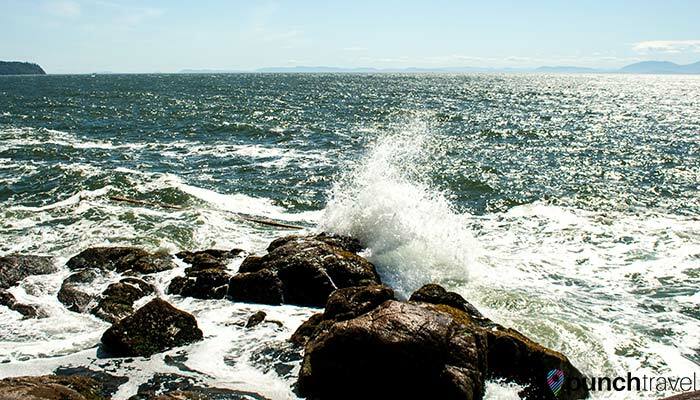 Although access is closed to the actual lighthouse, you can still take in great views of the lighthouse and surrounding waters by picnicking on the large boulder or picnic area nearby. Taking a boulder break overlooking the lighthouse and the water. Another great hike with scenic views of the coast is reached by heading right from the lighthouse, taking West Beach Trail. The trail deviates out to several scenic viewpoints overlooking Howe Sound. Continue down the Shore Pine Trail and stop at several lookouts along the way, connecting to the Juniper Point Trail. Several lookout points take you right up to the cliffs, where the ocean waves crash into the rocks, sending salt water spray in the air. If you head east of the lighthouse, take the Valley of the Giants Trail to walk among towering Douglas Fir trees. 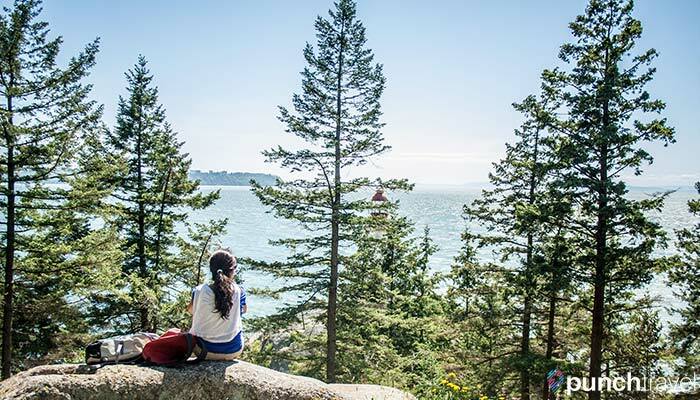 At the end of the trail, continue to Eagle Point for some scenic viewpoints of Burrard Inlet. Walking among the Douglas Fir trees. 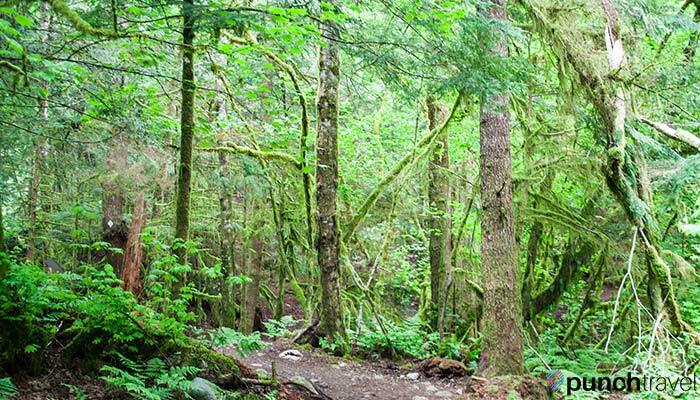 Located in North Vancouver, about 20 minutes from downtown Vancouver, Lynn Canyon Park offers several easy to moderate hikes to pass the day. We hiked our way into the middle of the stream. 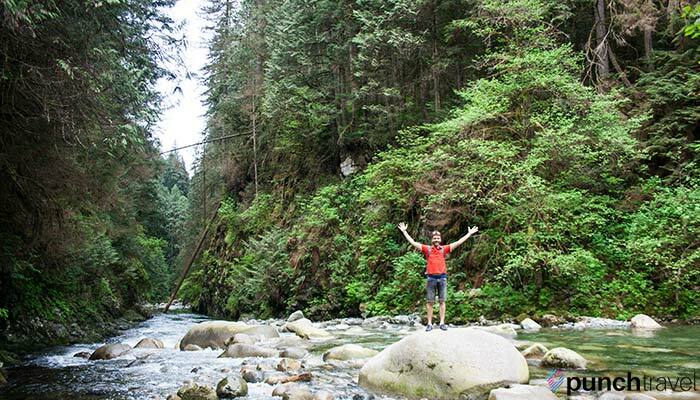 Most visitors come for the Lynn Canyon Suspension Bridge, a pedestrian bridge that swings 50 meters above the bottom of the canyon. 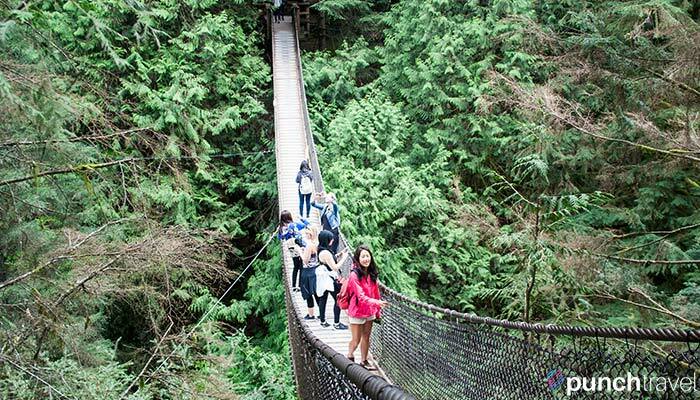 It is especially popular because it is a free alternative to the nearby Capilano Suspension Bridge, which, while longer, costs $40 to visit. The bridge is a short walk from the parking lot of the Ecology Centre and right across from the cafe. It is least crowded in the mornings and you’ll have a good chance of taking a photo without any other pedestrians on the bridge. I’m holding on to the side – it’s a bit wobbly! 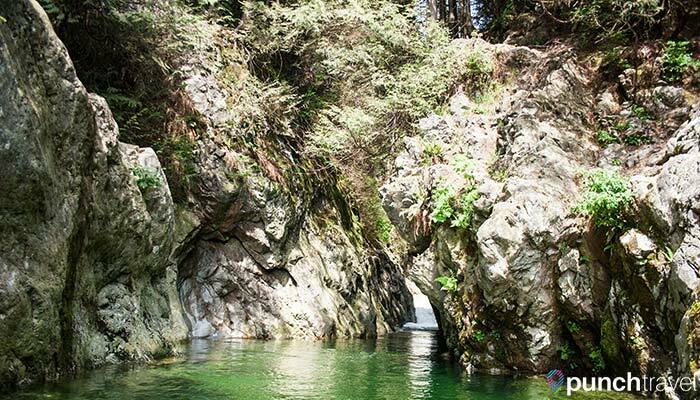 For a unique experience, hike about 20 minutes to the 30 foot pool, a crystal clear swimming pool at the end of a small waterfall. In the summer months, the area is crowded with visitors taking a dip in its pristine waters. Bubbling creeks wind throughout the park. When we visited in early May, several people were already picnicking on the rocks but the only one brave enough to swim was a playful puppy. 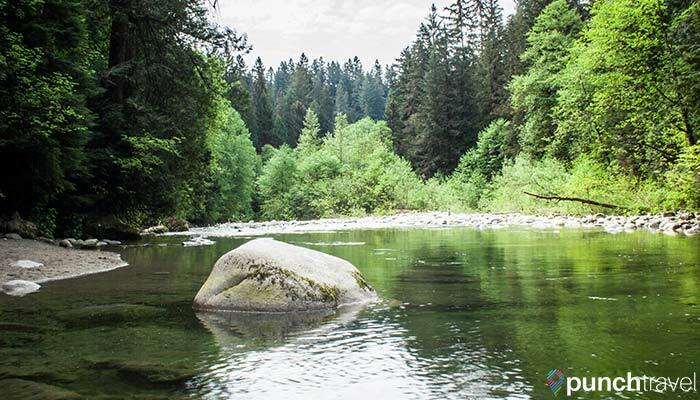 Take care because the water current can be fast and many rocks lie beneath the surface of the water so use caution if you do decide to take a dip. The 30 foot pool is fed by a waterfall behind the rocks. If you continue further along the path about 45 minutes from the Ecology Centre, you’ll reach Rice Lake. The lake is quiet and still, with your only company being the occasional fisherman casually casting a line. Stop and have lunch at one of the several benches around the lake. Rice Lake is absolutely still and serene. The trails in Lynn Canyon Park connect to the larger Baden-Powell Trail, which stretches along North Vancouver from Deep Cove to Horseshoe Bay. 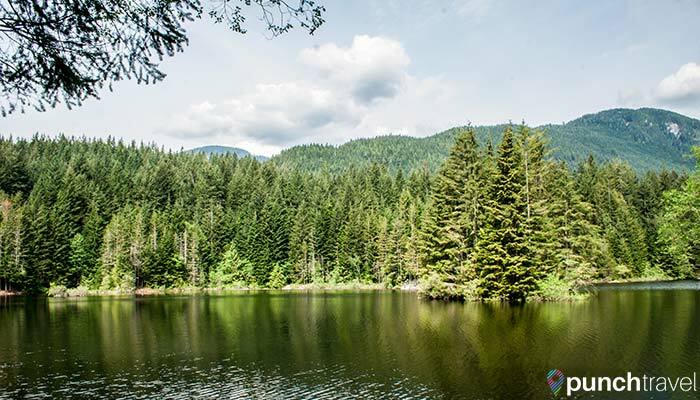 If you need more of a workout after completing the trails in Lynn Canyon Park, take the Baden-Powell Trail east to the town of Deep Cove. Here you can take in stunning views of the remote cove cradled between the mountains. If you’re feeling up for it, you can rent a kayak and explore the cove. If not, pop into Honey Doughnuts and try one of their legendary pastries. You’ve earned it! 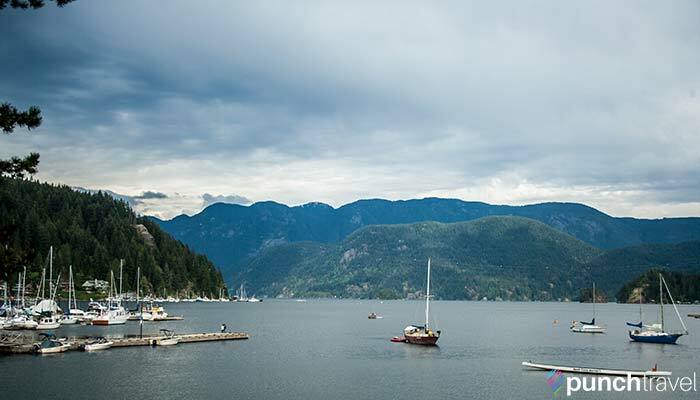 Picturesque Deep Cove Bay, where TV shows like Supernatural and Cedar Cove were filmed. Often erroneously called Squamish, the Chief is a mountain hike located in the town of Squamish about an hour from Vancouver on Highway 99. It consists of 3 peaks, each with varying levels of difficulty. 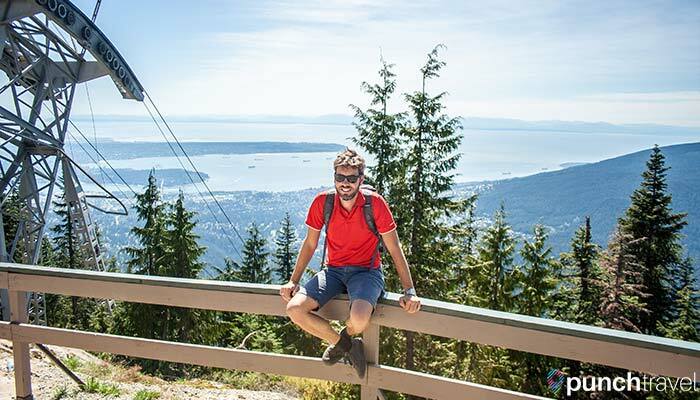 It’s a popular alternative to the Grouse Grind, another hike that takes you up Grouse Mountain, and our pick for the best difficult hike. 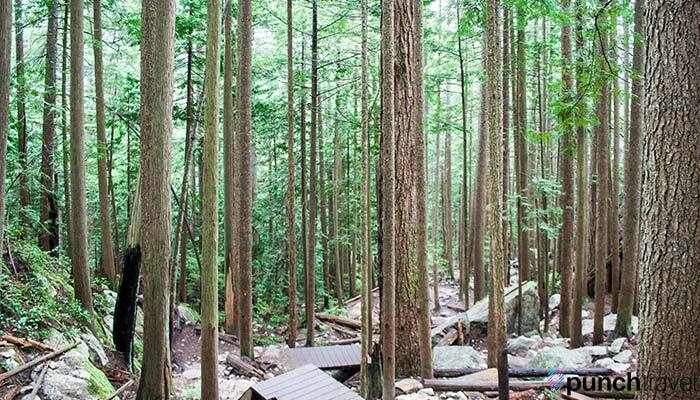 While the Grouse Grind can get crowded, hiking the Chief is a serene and peaceful affair. The drive up on Highway 99/Route 1 is a spectacular sight to be seen. Sweeping vistas of Howe Sound and the surrounding rocky mountains and islands dot the landscape as you wind through the mountainside. We parked at Shannon Falls, just before Stawamus, in order to catch a view of the majestic waterfall. The waterfall is just a short walk from the parking lot and is a popular photo spot. From there, a trail connects Shannon Falls to the Stawamus Chief Trail. 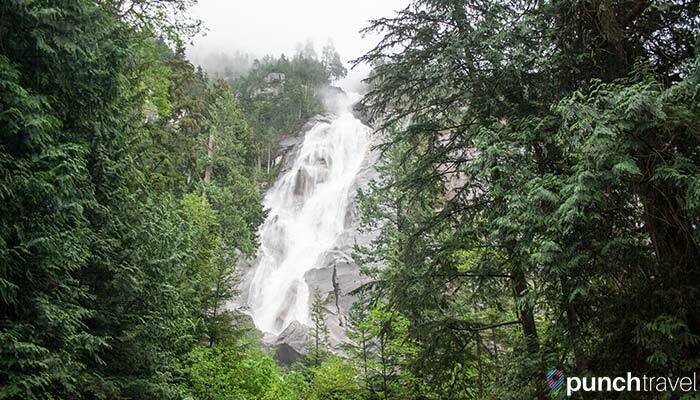 You can also walk from the falls to the Sea to Sky Gondola, and from there to the start of the Stawamus Chief Trail, for an extended hike. Shannon Falls drops from 335 meters. The clouds were low and the sky was misty when we embarked on our hike. We passed through the campgrounds where several tents were already set up despite the chilly May morning. The hike begins with relentless steep wooden steps, hugging the adjacent waterfall. The next two hours consists of a straight uphill ascension on a mix of wooden staircases and rocks. The path can be slippery and not always equipped with ample grips to steady yourself. Near the top, you have your choice of three peaks to tackle. Or if you can handle it, you can tackle all three peaks in one day. After polling a few descending hikers as we went up, we decided to opt for the second peak, which is about 50 meters higher in elevation than the first peak, but covers less distance. Once we were almost at the top we were faced with a giant, ominous rock face. Attached to the rock face are a string of chains for you to cling on to for dear life with (or attach yourself with a carabiner, had my mind not been racing with thoughts of my imminent demise). The path is slippery and narrow but if you hang on tight, you can zig-zag across like Spiderman with relative ease. 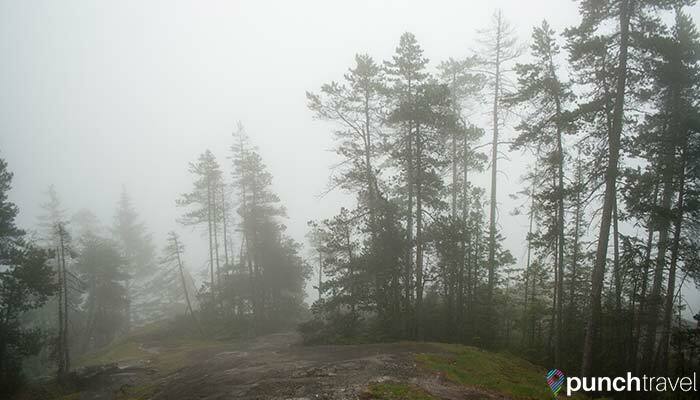 It had been raining earlier that morning, so the cloud cover was still high and visibility low as we hiked to the top. You can imagine that on a clear day the peak offers spectacular views of the surrounding mountainside and waters. Limited visibility from the top of the Chief. We reached a small cleavage in the rock which required an upward climb using the chains. With slippery and cold conditions, I declined to continue, but Matt was determined to make it to the summit. I held on to his backpack while he scrambled up. “Be careful!” I shouted, as he climbed out of view. Judging by the warning signs we saw at the campsite, I could safely assume that yes, there were indeed bears on these mountains, and I quickly shouted back to confirm. Within seconds, Matt was scrambling back down, having heard a deep growling while at the summit. Our hearts pounding, we quickly scaled back down the rock face, warning our fellow hikers of their potential fate at the top. Even though we were quite hungry by this point, we didn’t bother stopping anywhere near the top for fear of drawing out an uninvited picnic guest. Instead, we continued about 30 minutes down to a large, flat rock overlooking the valley below to stop and have lunch. As we descended around 2pm, many hikers were still making their way up. While the ascent was a relentless beating for my thighs, the descent was an attack on my knees. By the time we reached the bottom, I was clinging to railings and tree roots to ease the impact. The trail is a mix of rocks and wooden platforms. All in all, we completed the round trip climb to second peak in about 4 hours, including a 30 minute lunch break and several breaks on the way up to catch our breath. We are moderately and occasionally, active, so those of you who are more active will probably have an easier time of it. Unfortunately on the day we visited the clouds were low so there was no visibility at the top. However on a clear day, you can be sure to catch awe-inspiring views from the summit of the Chief. 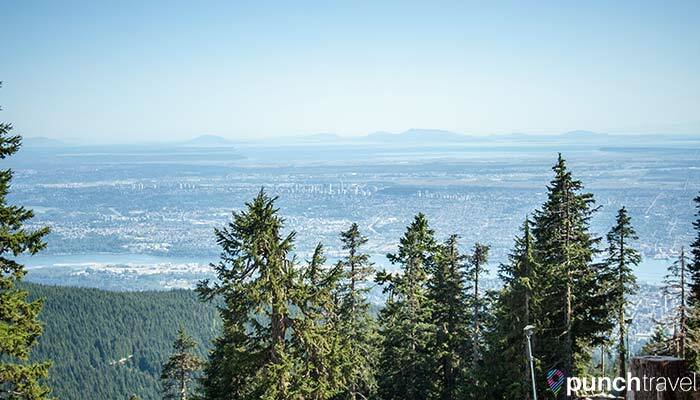 The name says it all – the Grouse Grind is a straight uphill climb of Grouse Mountain, a popular ski resort destination in the winter and a legendary hiking challenge in the summer. Getting there is easy, as it is only about 20 minutes from Vancouver, but parking can be challenging as it a popular tourist destination. In addition to the four paid parking lots, you can usually also find free street parking a little further away. The entrance to the hike starts on your left near Parking Lot D. The hike can often be crowded with others making the attempt, so the best times to go are during the week or early morning. A long list of rules are posted at the start of the hike, but the main one to keep in mind is that the hike is one-way only. Going down is not permitted due to the narrow and crowded pathways. The Grouse Grind is a total of 2.9 km (1.8 miles) and an elevation gain of 853 meters (2,800 feet). As mentioned, the path gets quite narrow and there isn’t a lot of room to stop and take a break. The pathway is very steep, and as you get closer to the top, more ropes and barriers are mounted to help you climb up. 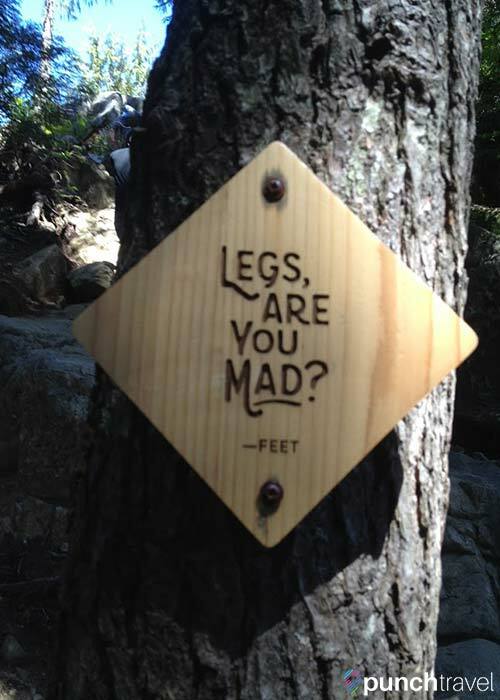 Several markers encourage you (or taunt you) along the way, marking each quarter of the trail. Hikers of all levels attempt the ascent – on the day we visited, we saw children as young as 10 years old as well as 70+ year old seniors making their way up, and not even complaining! Once you make it to the summit, you are rewarded with amazing 360 degree views of the North Shore Mountains, Howe Sound, Burrard Inlet, Vancouver and even as far as Mount Baker in Washington State. We made the ascent in about 90 minutes, which is the average time. The current record holder made it in 23 minutes! We did it! And in not too shabby of a completion time, if I do say so myself. All smiles now that we made it top. In the winter Grouse Mountain is a busy ski lodge, and in the summer several restaurants, bars and stores are still in service. Many activities are available in addition to hiking, including ziplining, disc golf and nature and heritage activities for children. 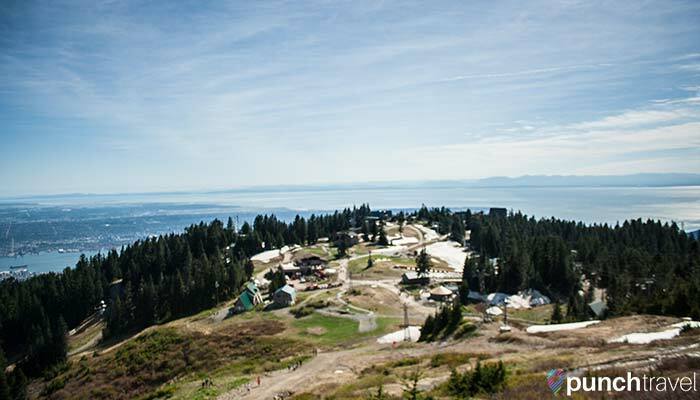 A look down at the view and activities available at the top of Grouse Mountain. 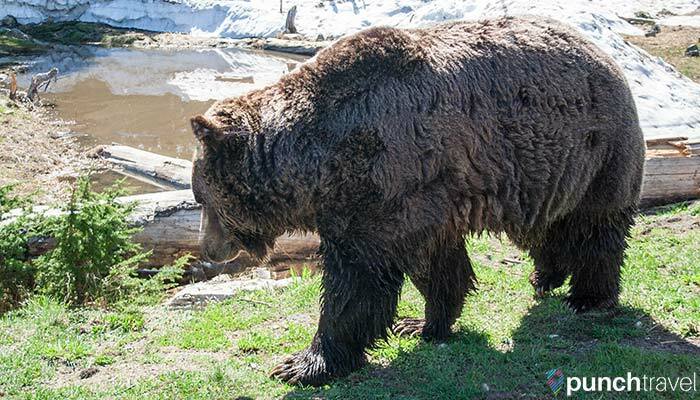 About 15,000 grizzly bears remain in British Columbia, and at Grouse Mountain, two of them reside in a habitat at the top of the mountain. During the summer you can often find the two young males roaming about their habitat, ready for their close-up. One of two bears in the habitat. Past the grizzly bear habitat you can continue walking higher to get even greater views. Near the top is a large windmill, a few chairlifts frozen in time, and the occasional group of zipliners whizzing by. The view from the top of Grouse Mountain. 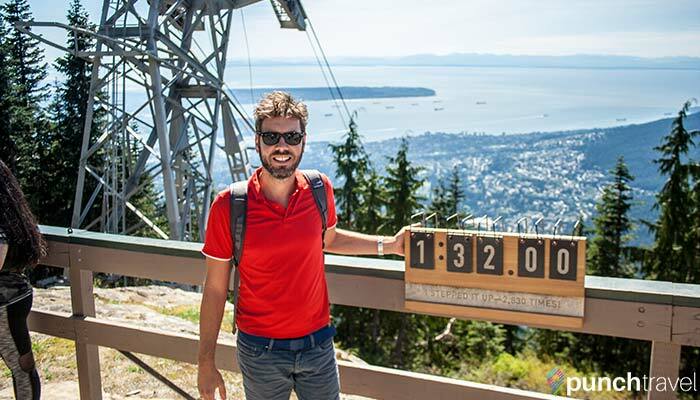 Once finished at the summit of Grouse Mountain, the only way down is by taking the gondola, which costs $10 for the 4 minute ride down. Pick up a ticket in the lodge and hold on tight for the ride down. The ride is completely safe, but it can be a bit unnerving to look down through the large glass windows, imagining that you are hang gliding down the mountain. 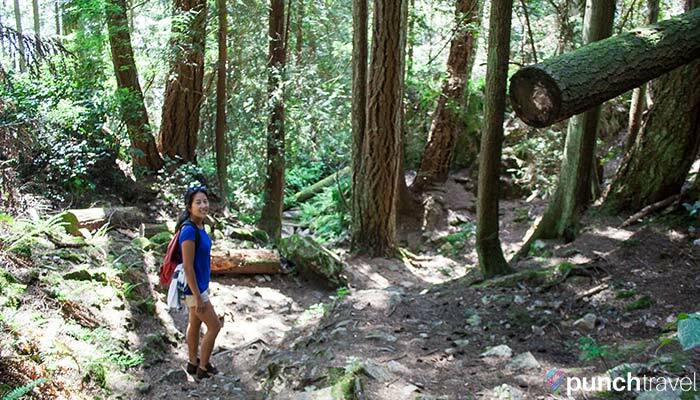 Did we miss any other great day hikes from Vancouver? Let us know in the comments!